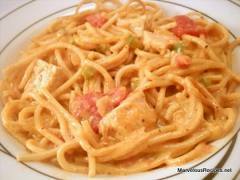 ...try this great chicken spaghetti recipe ! First of all boil and shred chicken. And then cook spaghetti and drain. Saute onions and peppers. Add tomatoes and soup. Bring to a boil and then simmer while cheese cubes melt. Add spaghetti and chicken to sauce. Stir well and serve. Nice taste ! The Mexican style chicken spaghetti is ready ! Enjoy it !